Online software providers can struggle to break into the industry having to go up against big names like Net Entertainment and Microgaming. However, there are a few who manage to do so successfully, and Quickspin is one of them. We take a look at the Swedish software developer and their games available to play for real money. Quickspin was established in 2011 by Daniel Lindberg, Joachim Timmermans, Mats Westerlund, and their team, all of whom use to work for big names such as NetEnt, Unibet and even the video gaming company, EA Games. Their vision revolved around creating games which filled the gap they saw in the industry – they viewed the market as lacking excitement and passion. Their view worked well for them as the Stockholm based company quickly became a household name due to their limited, but stunning and interesting, pokies. These pokies caught the eye of software developer Playtech, and they announced in mid-2016 the acquisition of Quickspin. The company will continue to exist under its name as a subsidiary of Playtech. Additionally, the founders will remain working for Quickspin for at least three years, as per the agreement. Quickspin offers quite a limited number of games but this is due to not being around for long and their intense focus on creating high quality games. This is not unlike software provider Thunderkick. Each title features a beautiful graphical interface and an easy to navigate format – with an easy access paytable. We take a look at three popular games from QuickSpin to show you what we mean. Gold Lab is a 5 reel and 25 payline pokie with a minimum bet of $0.10 and maximum bet of $100, providing a huge range of wagering options for players. 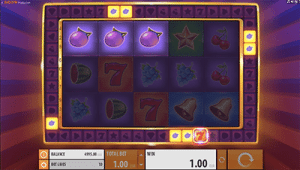 The pokie has the same design as all Quickspin pokies in the buttons to adjust coin sizes, to spin, and the winnings balance are all neatly placed in a bright graphical box under the reels. We are treated to a unique way of playing in Gold Lab, compared to any other title from Quickspin as there isn’t the usual free spins to activate – but there is still the chance to win big. Trigger the Golden feature by hitting three trigger symbols. Here the low paying symbols will transform into Wilds and you will be awarded at least four or more Re-spins. 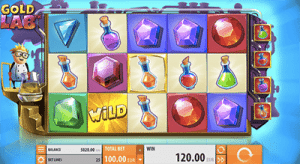 These Re-spins will generate some big wins thanks to the Golden Wilds substituting with higher paying symbols. What’s more is you can retrigger this feature. Spin the reels of Gold Lab at HouseOfJack.com. 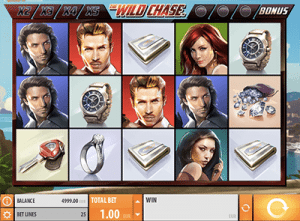 Wild Chase takes the traditional heist theme and makes it exciting again thanks to the high quality graphics which aren’t boring. It has a Fast and the Furious feel where all wins are awarded with Re-Spins and locked symbols. Similarly to Gold Lab, Wild Chase features 5 reels and 25 paylines with a minimum bet of $0.25 per spin and a maximum bet of $100.00. There’s also free spins and Wild Multipliers too, making this one game worth chasing. You can play this pokie at SlotsMillion.com. Unlike the first two pokies detailed here, Second Strike only has 10 paylines across the 5 reels. It also appears to be a jazzed up classic – great for those after a modern fruit machine. Players can bet a minimum of $0.10 and a maximum of $100, and aim to activate the Second Strike feature. This is easy as it is triggered on any win. Here, players which hit a matching symbol on the outside wheel will score from six to 10 additional symbols for another huge win – up to 100x the total with a five of a kind winning combination. Try this title out at Slots Million. The following pokies are also available to play and you can find them at House of jack, Slots Million, and Mucho Vegas online casino. Are Quickspin games secure and fair? Quickspin is licensed by the UK Gambling Commission – one of the best jurisdictions in the iGaming industry. This means the games have been tested and proven to be fair – free of manipulation. This is why Playtech were so eager to add them to their own highly regarded catalogue. You do need to play at secure online casinos however, as some operators can pirate the games and rig them in their favour. Secure sites are also licensed by top gaming jurisdictions like the UK Gambling Commission. These sites are all listed in the table above – click their links to sign up and get playing Quickspin pokies for real money.